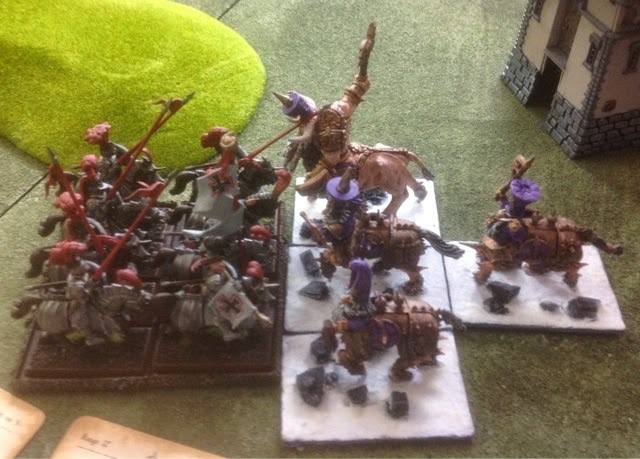 Had a couple of games today to try out some chaos dwarf units I have not used very much - bull centaurs, iron daemon and a dread quake mortar. We were playing a slight variation on the end times magic phase (no end times spells there is not an end times spell for the lore of Hashut ... Yet) and no recasting of spells if they are successfully dispelled or failed to cast. I found the end times magic phase to be too powerful and maybe too long (might be us as for most of us it was our first time using the end times) for a tournament. 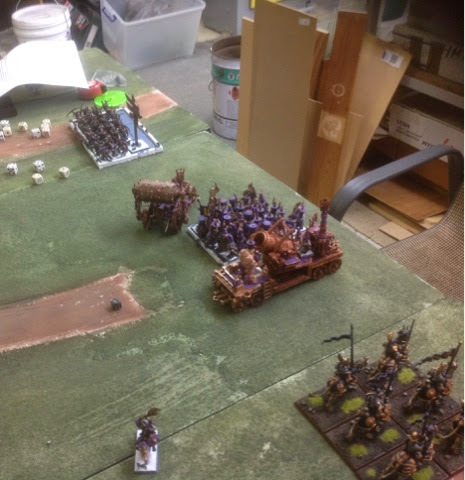 The first game was against a Demi griff heavy empire list. Lost by about 500 VPs as I lost both the iron daemon and mortar. 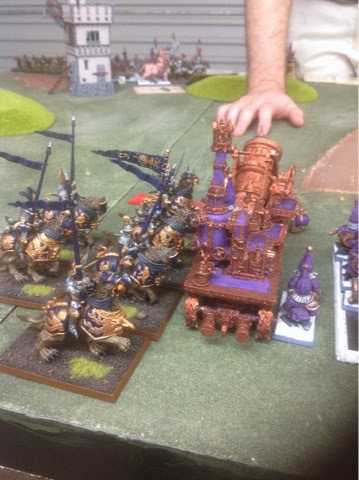 Mortar was pretty effective against the steam tank but I was too conservative and held the iron daemon back. The mortar is in some serious trouble. 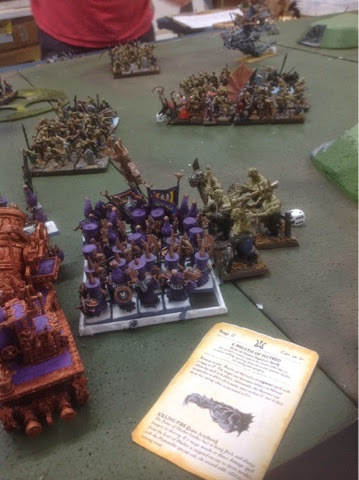 It was the last turn so I never got to see how the Warriors would go against the big chickens. 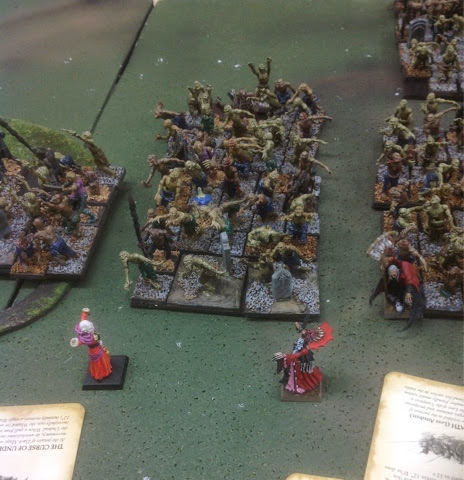 Second game was against a mass zombie vampire counts with four vamps, necromancer, a couple of vargheists, mortis engine and hordes of zombies. The magic phase was a huge problem for me as the zombie hordes almost doubled in size. I had never seen the engine before in a game and I was pretty impressed by its buffing ability. 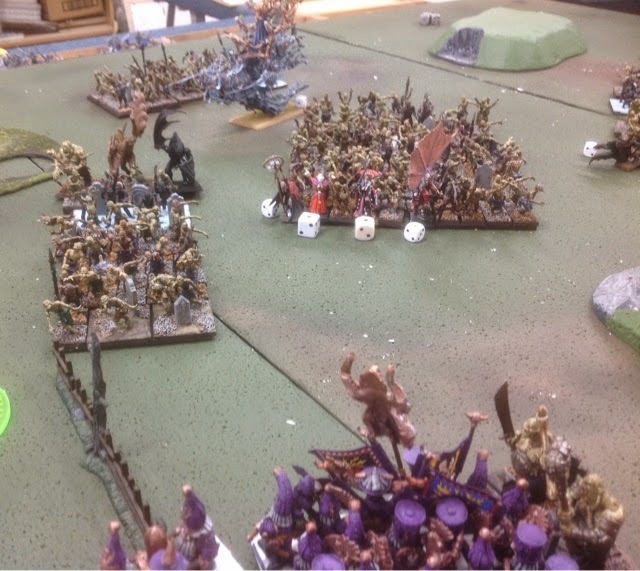 Lost the iron daemon to heroic killing blow vampires as the pics below show. 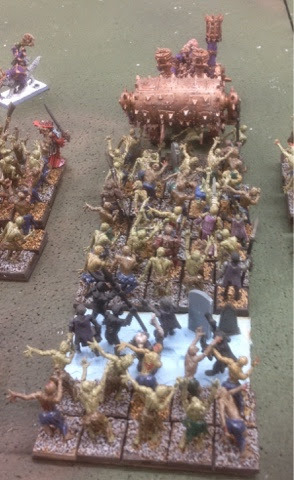 Bull centaurs got stuck into grinding combats on the left flank with two units of zombies. 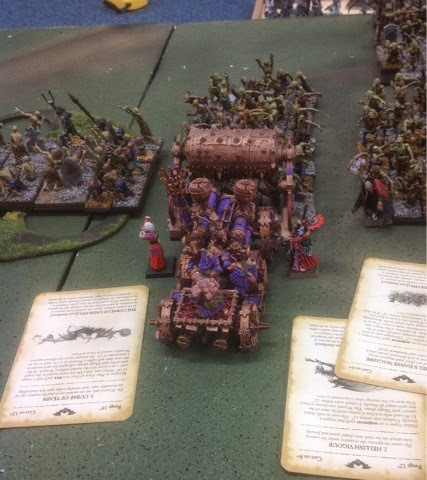 Pic above: the iron daemon dies to some killing blow vampires with magic re rolls to wound. Pic above: can you count the number of zombies coming in- thanks goodness the games ended before they arrived. My dice rolling and in particular magic rolling was terrible in this game- the result was I lost as I could not wipe out units and those damn vampires kept getting their wounds back. Iron daemon is difficult to use and I think the combination with the kdaai destroyer is the best option. I need to rethink my approach to using the Hobgoblin heros as redirectors- I think I might drop them and for the upcoming end times tournament I will go back to the blunderbusses with magma cannon, death shreiker and a level 2 wizard. I am going to drop the lore of Hashut for this tourney only and take fire. I am not quite sold on the bull centaurs yet so will also drop them in favour of the castle war machine heavy list.